Italy is one of Europe’s most popular holiday stops – and why not? Great food and drink, a relaxed and laid back culture/lifestyle, and some budget-friendly travel options make it perfect. But did you realise that Italy has nearly 75 islands, including both islands off the coast of the peninsula, as well as islands inside some of Italy’s lakes? I thought it would be fun to highlight some of the best and most beautiful island spots in the country. 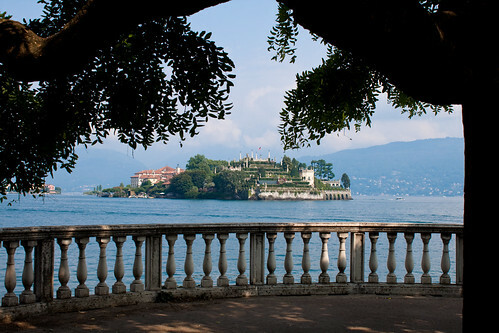 Isola Bella has a beautiful name and is a beautiful spot to be on a sunny afternoon. It’s on Lake Maggiore, one of Karen’s favourite Italian lakes, and it is one of three islands in the lake but this is the only inhabited island. There is only one thing to see here, and that’s the Palazzo Borromeo, a wonderful palace built in the late 1600s; the popular tourist feature are the lovely Italian gardens. Because of its popularity with tourists, you can get here from Stresa, Intra, Pallanza, or Laveno. One of the islands in the Tuscan archipelago, this is the third largest island in Italy, and it is believed that this was part of a land bridge that connected mainland Italy to Corsica. Both the Greeks and Romans built here to take advantage of many local minerals, such as iron. Tourists like the beaches, but you get a fantastic view from Monte Capanne, the highest point on the islands. Ferries leave from Piobino, the same port that has been here for centuries. Ventotene is part of the Pontine Islands, historically famous as a retreat for the wealthy and then as a spot where bothersome citizens were exiled as well as a military fortifications. Today is not much different (apart from the exiled citizens, of course). Lipari is an island off the coast of Sicily, and situated between Vesuvius and Etna, thus placing it squarely in volcano territory. The island is covered in ash and pumice, and pumice is a huge local industry, alongside tourism – the island’s population doubles in summer. You might want to visit the Lipari Archeological Museum, which contains some interesting artefacts on local history and volcanic activity. To get here you’ll have to take a hydrofoil from Naples, connecting in Salina. Barbana is a small island famous for its buildings – there are few but the ones that are here are beautiful. The Barbana Church is a must see, which sits behind the Marian sanctuary. A settlement was founded here because an image of the Virgin Mary found its way here. The Franciscan monks are the only people who live on the island, which you can reach by ferry from Grado, near Trieste. Murano is actually a series of islands connected by bridges, collectively known as Murano Island, found in the Venetian lagoon just north of Venice. It’s a hugely popular daytrip from Venice for those who want to see the glass making factories that are so popular here; the glass-makers moved here in the 1200s because of the risks of fires in Venice. Murano also has some colourful buildings similar to Venice. 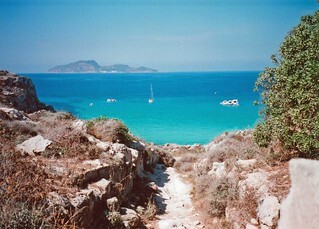 Sardinia is the second largest Italian island, though not as popular as its southern counterpart, Sicily. It has some very famous beaches, with waters that glow in turquoise and deep blue. The island is quite hilly, and in amongst these hills are some ancient Phoenician and Roman towns, such as the iconic ruins in Tharros. You can actually fly here from the UK, but there are both ferries, train ferries, and bus ferries. Consider the train on the island too, for great views. Favignana is just off the west coast of Siciliy, and with a quick hydrofoil trip from the mainland, it is a popular spot for tourists who like the relaxed atmosphere. Scuba diving and snorkeling are the main draw because of the many caves and rock formations. Tourism is the primary industry now, though there are some small fishing villages and ruins on some of the hills to explore. 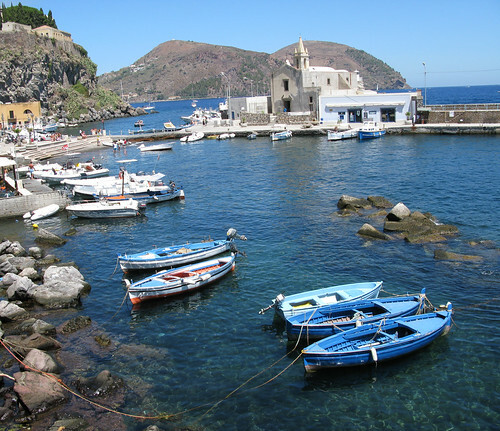 Ischia (see top picture) is located just off the coast of Naples, and tourism has long been a feature here. Many have flocked here for the thermal spas, but in recent times the island has also become a popular film backdrop. There are plenty of sights to see, from unique land formations, Aragonese Castle, ancient tree and gardens, and some wonderful beaches. Last but not least, Lampedusa is an island far far off the Italian coast southwest of Siciliy; flights are available to here in the summer, and year-round ferry service from Agrigento in Sicily. Lampedusa is geologically part of Africa, with the shores of Tunisia not too much further than it would be to travel back to Sicily, making it a hotbed for illegal immigration from Africa. Lampedusa has some little known beach resorts, sea grottos, and peaceful walks around the island. What’s your favourite Italian island?